What’s the Difference Between Databases, Segments, and Tagged Lists? Personalization and advanced targeting has become a necessity in getting the most out of your email campaigns. For this reason, managing your marketing contact lists has become more complex, and without the right tools, it can make any marketer's head spin. Let’s face it, a “one-size-fits all” approach just doesn’t work anymore. And, it's no longer as simple as creating a targeted list of small-to-medium sized businesses or women who live in California. You’re now expected to track where the contacts come from, open and click-through behavior, as well as very specific details about a contact’s role, demographic, company, shirt size, favorite vacation spot, pet’s name, etc. – okay, maybe you don’t have to go that far, but you get the point. Compiling this data and tracking it manually can be timely and complicated. 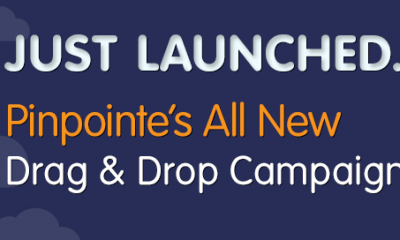 Pinpointe has simplified and streamlined contact management through a three-part tool set including databases, segments, and tagged lists, which minimizes the complexity of list management by offering multiple ways to manage, search, and update dynamic contacts in your marketing lists. 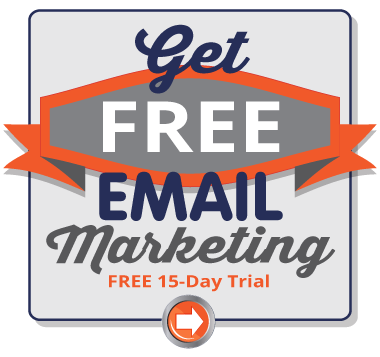 Basically, it keeps your mailing lists organized so you can better target your audience, increase your response rate, and receive fewer spam complaints. This flexibility helps you keep your contacts in sync with your marketing content and campaigns – ultimately making your email marketing goals a possibility. With this control, you can be sure the right people receive the right information. After all, targeted marketing speaks louder than those irrelevant campaigns that make contacts click “unsubscribe” without a second thought. Let's cover each tool in the toolset, as they are all good for a different scenario. The below infographic is a perfect visual description of how databases, segments, and tagged lists work separately and together. 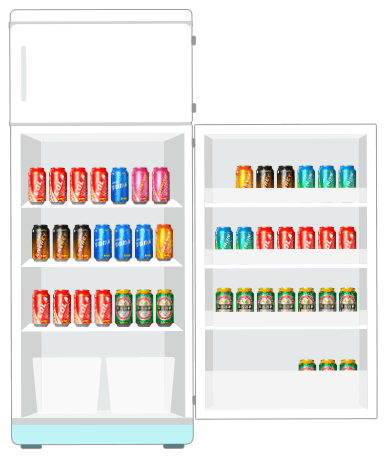 Now, let’s put our party hats on and imagine your email database is a fridge, segments are groups of certain types of cold beverages in the fridge, while the name tags on those drinks let you know who those claimed them – those are tagged lists. 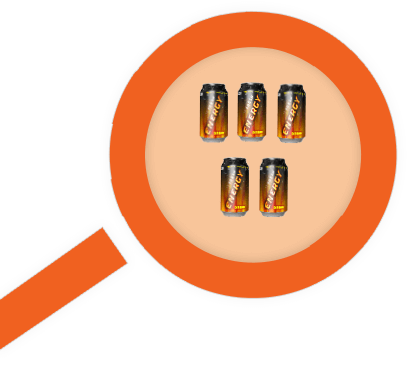 As you can see, drinks (contacts) can have multiple name tags, so they can belong to multiple tagged lists. Databases in Pinpointe have been renamed – they used to be called “lists.” You need at least one of them in your Pinpointe account. Larger companies who manage different sales regions can benefit from multiple databases if each sales region has different send-from protocols and guidelines. Using one main databases is recommended unless you manage multiple websites, businesses, or business divisions. The reason is because if you have the same contact in multiple databases, that contact will be managed as two different contacts. So, if they unsubscribe from one database, they still may receive emails if your sending an email to your other database, thus creating possible frustration if they have already opted-out. Avoid the extra work of having to unsubscribe that contact from the other databases by using segments. Remember – multiple databases are best for keeping contacts of separate business entities, websites, or divisions separated – if that’s the case for you. 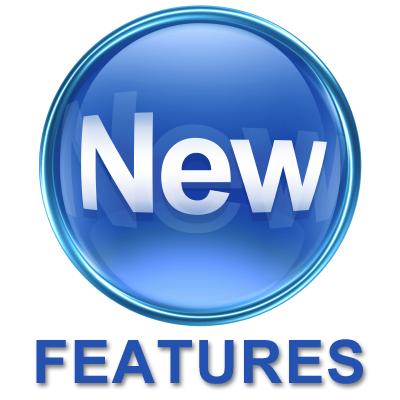 Segments are essentially saved searches or dynamic lists that allow you to pull information from multiple databases and search for specific field values or behavioral information, such as click-throughs or opens. Segments offer the most flexibility for creating a truly targeted list as you can search endless amount of data on both built-in fields, as well as the custom ones you add. Therefore, you will want to put everything you know about customers into your Pinpointe database. The list of contacts you get back from a search is called a segment – they are a segment of your database. Let’s say you want to email a campaign to those contacts who subscribed via your website AND have interacted with at least two of your emails in the past 6 months AND are from the western area of the United States…segments are your new best friend! We highly recommended leveraging segments versus multiple databases as you can better target audiences while maintaining unsubscribes more effectively. 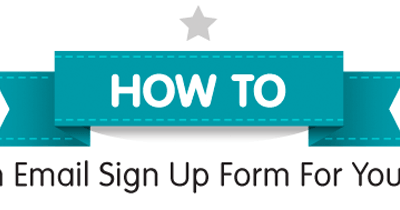 Remember- Segments are best for creating very targeted email marketing lists. Tagged lists are lists within your database. This means one contact can be in multiple tagged lists and Pinpointe manages that contact as a single entity. Contacts can have multiple tags, so if you want them to be part of the spring customer campaign, they can also be included in the fall customer event invite list. 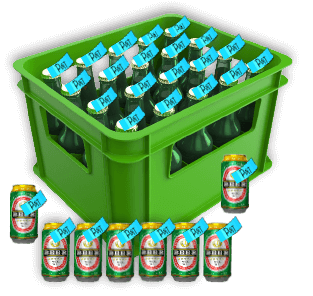 If you only have one database, then you will become very familiar with tagged lists. One very common tag is to identify the source of your contacts when importing them into your database, so if you received new subscribers from your website over the past month, you can title it as “website registrants_Oct 15.” The contact will have that tag along with any others you add as you market to them, showing a complete log of your engagement with them. You can also remove a tag from a contact, and the contact will still remain in the database and a part of any other tagged lists they belong to. Remember- Tagged lists are great for tracking your email marketing while keeping your contact list clean and easy to market to. The key here is that these three options offer flexibility, so that no matter what your email marketing goals entail, you can manage your contacts with ease. If you want to target your marketing to certain contacts, you can and in multiple ways! As I mentioned earlier, pictures do speak louder than words. 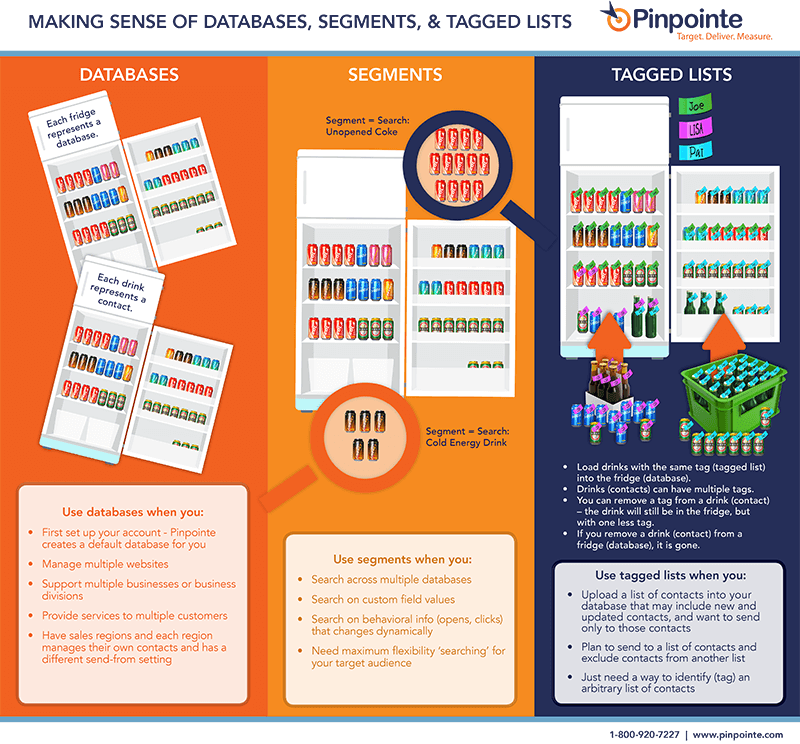 Download the “Making Sense of Databases, Segments, and Tagged Lists” infographic today and jump into Pinpointe to see which one suits your email marketing needs.